It’s New Year’s Eve! Another year over, and a fresh one up and coming. As we enter 2015, I just wanted to take a moment and say “thank you”. Thank you, everyone, for reading my story and giving me a few moments of your day three days a week. I appreciate all the readership and support for what I do here. I’d also like to take a moment to advert my other webcomic, The Adventures of Sue and Kathryn. 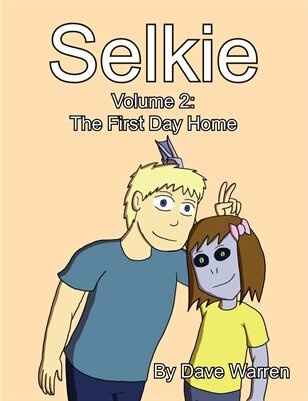 It updates on Selkie’s off-days, and recent finished it’s first storyline. If you haven’t seen it yet, give it a whirl! I'd like to think I was Nate as a kid, but I wasn't ever that polite. I’m just glad I don’t have to look at that smug prick’s face anymore. Nathaniel bothers me more than any other character. I hate him. Yeah, but it was the way he did it–“You’re totally busted”–that bothered me. The way he was speaking implied that he was going to blackmail Todd, and since that didn’t happen, I’m assuming that he’s keeping the incident as an ace up his sleeve to pull out at some future date when he and Todd disagree at a PTA meeting and Nathaniel wants to discredit him. Or maybe I’m reading too much into his accusatory language. Just a tiny bit. No big deal though. I kinda did myself. She does want to be a mad scientist. Selkie, have you been reading _Calvin and Hobbes_? Aw, man. That last comeback… I wish I’d seen this (or thought of it myself) back when my kids were young enough for that to be relevant. Everything else aside (the drama of being “busted,” the confrontation with the Principal, etc. ), it’s sweet to see this Selkie & Todd moment: “Thanks you for fighting for me.” She’s loved, and she knows it. I love how Selkie seems to think that a pet cow would somehow be a constant source hamburgers, like with chickens & eggs. Well, obviously it would be a regenerating cow. At least she knows that hamburgers come from cows. So many kids that age think they come from stores. I’ve met fully grown adults that ddin’t understand things don’t just magically appear in stores. Reminds me of the joke about the pig with the wooden leg- “Pig like that, you don’t eat all at once”. No, thanks to your father for “talking” to me. Nate seems like a swell kid. His dad does a good job parenting. Most parents do the whole, “Oh leave them be they’re children. If they want to scream and cry and throw tantrums in public, well that’s perfectly fine.” thing and leave it at that. At least some parent is actively trying to twach their kid to be well behaved and polite. Props to Nathaniel if he’s trying to instill politeness and manners into Nate. Y’know… I remember Todd has a terms-TBD grounding coming for Selkie over her behavior in the Turkish cafe. If her behavior (specifically re: goat kebabs) can be boiled down to “too happy to contain herself”, and so could Todd’s re: that kiss… is Todd going to take that into consideration when setting the exact terms of her grounding? Not that he shouldn’t ground her or discipline her somehow, but I at least hope he learns from and is humbled by his all-too-familiar failings. No no no – thank you! And it’s 6 days a week for me: MWF for the comic (and vote); TTS to read the comments (and vote). Sunday is S&K day – all three in one sitting. Thank you for the votes! Oh yes, you’re on TWC … guess I should add you to my regular voting bookmarks. Yup. I’ve been reading “Sue and Kathryn”…but, I’ve gotta admit, it hasn’t grabbed hold of me like “Selkie” has. But I’ll keep reading it. I always imagined you were more of a Todd as a kid. I know I was. Why cant she have a flamethrower? even in california they are perfectly legal to own… you cant OPERATE ONE but you can OWN one. I for one would start her on something smaller, 20 gauge shotgun or a proper armalite based platform.